LAS VEGAS – Jan. 19, 2017 – Five decades after the first “Super Snake” rumbled out of the factory, Shelby American Inc. unveiled the all-new 50th Anniversary model today in the Ford Performance exhibit at the Barrett-Jackson Scottsdale auction. To commemorate the anniversary of the legendary Shelby Super Snake, only 500 of the 2017 models will be built with a new lower MSRP beginning at US$69,995 including the base Ford Mustang GT. The new Super Snake marks a significant next chapter in the company’s history. Based on the world-class Ford Mustang GT, the new Super Snake is equally capable on the road and the track. Shelby American collaborated with partners like Ford Performance, Borla, Michelin and Wilwood to create an even more focused car. The new Super Snake is an exercise in subtle details and features many first-to-market products. Working with Ford Performance, Shelby American sharpened the handling of the independent suspension and then upgraded the brakes with massive calipers and rotors. Under the hood, the Super Snake combines Ford’s iconic 5.0 V8 engine with forced induction for 670 horsepower; optional superchargers can pump out over 750 horsepower. The result is a well-engineered car with stunning capabilities. On pump gasoline and Michelin street legal tires, a properly optioned Super Snake can go from 0 to 60 mph in just 3.5 seconds, blaze through the quarter mile in only 10.9 seconds and deliver an amazing 1.2g on the skip pad. One look at the Super Snake reveals unique Shelby styling that is smooth and integrated. The car features a new hood, rockers, spoilers, splitters, grilles, fog lights, rear tail panel and rear diffuser assembly. Additional styling cues also include anniversary stripes and badges. Inside, the anniversary theme continues across the seats, dash and floor. The exterior of the car began life as a scaled computer model in CAD. Every part was then taken through an OEM process to develop the final product. Almost all Shelby-exclusive components were developed and tested with original equipment manufacturers. The Super Snake is available in all Ford factory colors and can be ordered with a manual or automatic transmission. The car is covered by Shelby’s limited three year, 36,000 mile limited power train warranty. The cost of the package is $36,795 not including the Ford Mustang GT, making a complete car about $69,995.00. An extensive list of options is available, including larger superchargers capable of over 750HP. Each Super Snake is assigned a Shelby serial number that is documented in the official Shelby Registry. A separate plaque signed by the build team will be affixed under the hood. Shelby American will build cars at its assembly facility in Las Vegas and Shelby American global mod-shops. 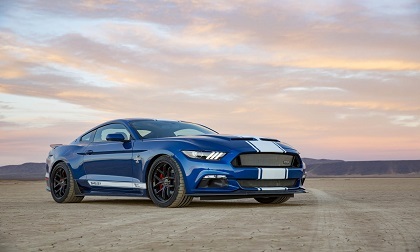 For more information about the all-new Shelby Super Snake or for a list of authorized dealers worldwide, visit www.shelby.com. Founded by Carroll Shelby, Shelby American, a wholly owned subsidiary of Carroll Shelby International Inc. (OTC Pink:CSBI), manufactures and markets performance vehicles and related products. The company builds authentic continuation Cobras, including the 427 S/C, 289 FIA, 289 street car and Daytona Coupe component vehicles; it offers the Shelby GTE, 1000, Super Snake and Shelby Terlingua Racing Team post-title packages for the 2005-2017 Ford Mustang. Shelby American offers the Shelby Raptor and Shelby F-150 muscle truck. For more information, visit www.shelby.com.